Comfort, cost, reliability and the environment. All good reasons to use cloth nappies for your baby. If you want your baby to enjoy the luxury of cloth nappies then you've come to the right place. We have lots of reviews, articles, classifieds and a really lively forum for you to get help and chat to other mums and dads. Have a look at the preloved classifieds section to buy and sell your second hand nappies and baby gear. There are a growing number of reusable cloth nappy and diaper enthusiasts. Their reasons vary from concern about the environmental and health impact of disposables to the simple reasons of reliability, baby's comfort and cost. Many parents use them just because they look so fantastic! Our aim is to provide all the information you need about the modern cloth nappy through our review, articles and information pages. If you can't find what you need please ask on the parenting forum. These include prefolds (a rectangular nappy with 3 layers) and terry squares. 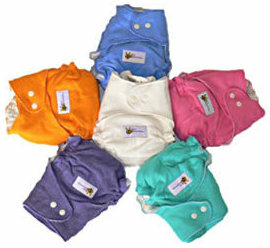 These nappies can be made from textiles other than cotton, such as bamboo or hemp. They need a cover, wrap, soaker or pilcher. (Also referred to as a Modern Cloth Nappy (MCO) or as a two part) - These are made of various textiles such as cotton, bamboo, hemp or micro fibre (an extensively used man made textile). Fitted nappies can be fastened by poppers, hook and loop (such as aplix or velcro) or a nifty alternative to the good old fashioned pin called a Nappy Nippa or Snappy Nappy, depending on where you live. These significantly reduce the chance of spiking your baby when changing. This type requires a cover, wrap, soaker or pilcher. These are the newest types of cloth nappy. They do not require any kind of cover, wrap, soaker or pilcher as the waterproof layer is built in. Pockets have a waterproof (usually PUL) layer on the outside and a fleece layer on the inside. You insert an absorbant material in between. All in One or All in Two have the absorbant and waterproof layers sewn together all ready to use on your baby. Have a look at the Reviews, Information and Articles sections to give yourself a good idea of what all the fuss is about. There's lots of information to help you with all aspects of choice, use and maintenance of cloth nappies. Whether you are new or completely addicted to modern cloth, we have a lively and friendly forum community who are always happy to answer questions, give help, tips and advice. Check out the reviews provided by our members to help you choose the right product for you and your baby. You can see the cloth nappies, wool covers and other creations some of our members are making and selling in Wahm Wonders. You can buy and sell your preloved nappies in Classifieds. Enjoy your visit here and please contact us if you can't find what you are looking for. Have fun! Work out your baby's due date the easy way. You can use our pregnancy calculator to work out your baby's approximate arrival date or your date of conception. Also work out how long you have been pregnant for on a future date. Try our PayPal calculator to work out how much a PayPal transaction will cost you in your country.